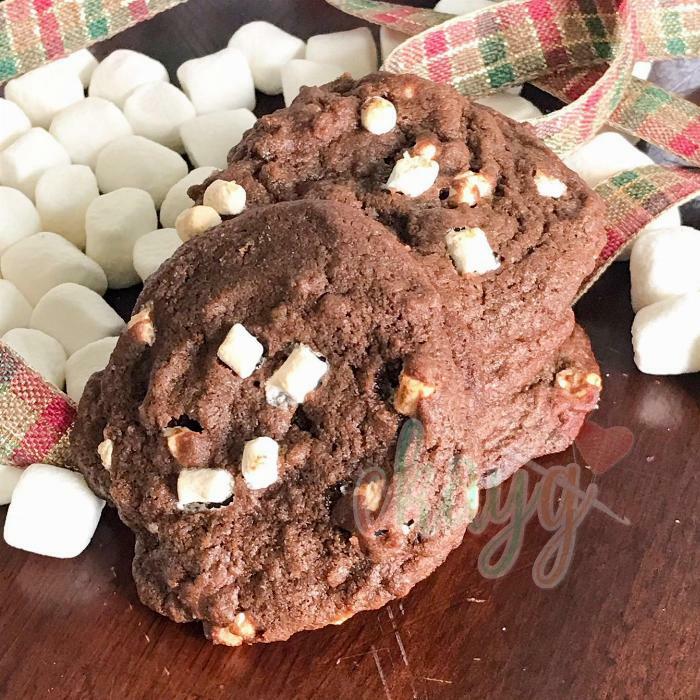 These cookies were made to taste exactly like my Gingerbread Hot Cocoa, and they really do! Also, they are some of the only cookies I've made which are actually better the next day! They actually get softer! 1Preheat the oven to 350 degrees F, and lightly grease cookie sheet, or line with parchment paper. 2In a large mixing bowl, cream together the butter and sugar. 4Mix in cocoa, flour, cinnamon, baking soda, cloves, allspice, and nutmeg. 5Stir in the chocolate chips and mallow bits. 6Scoop onto your prepared cookie sheet, approximately 1 Tbsp of batter at a time. 7Top each cookie with a few extra mallow bits before baking. 8Bake for 9 minutes. Allow to cool a few minutes before transferring to a cooling rack. This recipe should make approximately 24 cookies if divided up evenly. They are quick and easy to make! I have even dumped everything in a bowl at once and mixed up, with no problems!